Shuush is a web-based Twitter client that allows you to focus attention on the people that tweet less frequently. Twitter users are assigned a frequency level of 1-11, calculated as a function of how many tweets per day each user has averaged since joining. A simple on/off switch allows you to flip between normal and amplified views, the latter giving a visual boost in text size to those infrequent but valuable tweets that often get lost in the firehose. The updates of less active tweeters are scaled up whilst more active tweeters are scaled down, making it easy to retrospectively scan the tweetstream of people you are following for those rarer communications. This is a really useful tool, for dialling down the level of frequent updates and surfacing the missed messages, to achieve the balance that Twitter currently lacks. It would be great to have a way of doing this with hashtags too. Tweet Cloud is an online service that lets you generate a customizable word cloud from your tweet archive. 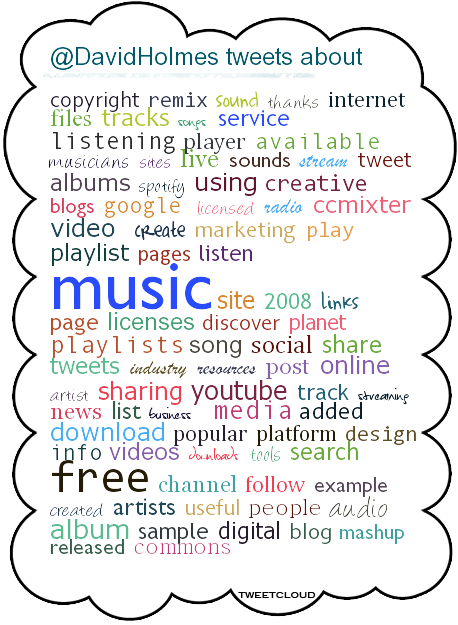 Log in using your Twitter account to create and save multiple word clouds at an address like http://tweetcloud.icodeforlove.com/DavidHolmes - Clicking the image above will take you to the saved cloud page. Each page has a date stamp at the time of creation. You can also view clouds by people you follow that also use Tweet Cloud, via the Friends link once logged in (top right). Recently created Tweet Clouds are shown on the homepage, which is useful for discovering people with similar interests. Note that upon generation a tweet is automatically posted in your tweetstream along the lines of: " I just generated my #TweetCloud out of a year of my tweets - http://w33.us/1ta" or whatever the period it is you choose ie. a day, a week, a month, 3 months, 6 months, a year. You're also given a choice of small, medium, large or HUGE cloud sizes. 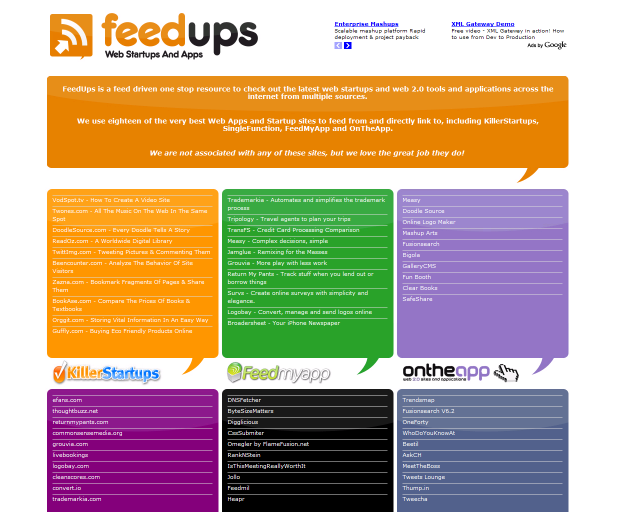 FeedUps is an online feed aggregator for news about Web 2.0 tools and services. It provides a one-stop resource for quickly scanning 18 popular sites focusing on Web startups and applications. The video has received widespread attention, appearing on popular websites like Laughing Squid, Wired, and Gizmodo. Jarbas's friend, Sean Crownover (Candlegravity) from Tokyo, has also posted a version on his FaceBook page (player bottom left). "...recombinancy appears everywhere as a natural evolutionary and creative process. All the great books in the English language, for example, are constructed from recombinations of the twenty-six letters of the alphabet. Similarly, most of the great works of Western art music exist as recombinations of the twelve pitches of the equal-tempered scale and their octave equivalents. The secret lies not in the invention of new letters or notes but in the subtlety and elegance of their recombination." Tracer is a free online tool that tracks where your website content is reused and inserts an attribution link back to the original published source. It also provides analytics to help you understand and measure user engagement. You simply add a line of java script to your blog or website and whenever someone pastes your work to another webpage, Tracer automatically generates a return link including Creative Commons license details if applicable (full instructions are given). Tracer tracks when users copy content from your web site and automatically adds a link back to the original page when your content is pasted. So, why do you need Tracer? Generate more visits and page views. Get credit when content is copied from your site. Measure and understand user engagement. Improve your search engine ranking. Tracer is easy to implement and offers a convenient way to track user interaction and generate site traffic. Supports Blogger/Blogspot, Ning, Register.com, Typepad, WebsiteWorks.com, WordPress. View more presentations from Adam Singer. A 4-minute roundup of significant web trends and developments in 2008, created by Orli Yakuel using Animoto. Via Socialmedia.biz. A favorite new tool I started using in 2008 is Tagfoot, a social bookmarking service that offers a range of cool media and revenue-sharing features. It’s about to go into public beta but if you want to get in early you can sign up using this link to my Tagfoot Media Archive. Happy New Year! This report highlights the various ways Social Media is impacting consumer buying trends. View in full screan mode and use the magnify tool to optimize for your monitor. You can also download the PDF version and view the online slideshow here. Perspctv is a dashboard for comparing and monitoring search queries in realtime. The service also provides data comparison widgets of your search results to put on your webpages. The widget shown here compares today's Google search volume, news and blog mentions for the keywords Google, Microsoft, Yahoo.